Effective communication between clinicians and patients builds a foundation of trust. That trust can lead to more accurate diagnoses, greater adherence, and improved patient outcomes. Better communication may also lead to enhanced patient satisfaction and HCAHP scores. 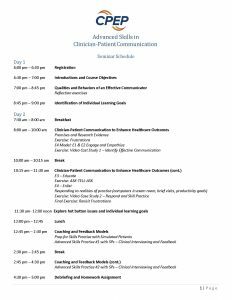 This course is designed to help clinicians refine and enhance critical communication skills. The intensive 2.5 – day program provides education and opportunities to practice new skills with simulated patients. Like all of our courses, this multi-day program is designed to fulfill licensing board or credentialing requirements for remedial education, but is also appropriate for those who simply wish to improve their skills. If you require Clinician-Patient training prior to the November 2019 session please contact Bonnie-Lyn Cahoon at 303-577-3232 ext. 231. 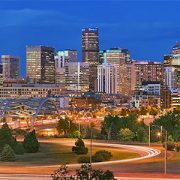 This course is offered two times per year in Denver, CO. Please Click Here for a list of available sessions. A list of upcoming courses is at the bottom of this page. 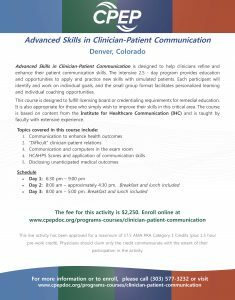 How do I enroll in Advanced Skills in Clinician-Patient Communication? Enrolling in this course is easy. Simply Click Here to access the registration page. What do others say about Advanced Skills in Clinician-Patient Communication? Who is eligible for Advanced Skills in Clinician-Patient Communication? This course is suitable for any healthcare professionals or trainees who could benefit from learning how to enhance skills in clinician-patient communication. The cost for the course is $2,250. UCHealth Memorial Hospital designates this live activity for a maximum of 19 AMA PRA Category 1 Credits ™. Physicians should claim only the credit commensurate with the extent of their participation in the activity. Course development is funded through a grant from the COPIC Medical Foundation.